In this 6 week course we'll zip through all of the essential techniques you'll use time and time again in dressmaking. We'll take you through measuring your body and making alterations, to demystifying pattern terminology, and of course constructing a garment. At each step, we'll run through multiple options for each technique: different seam finishes, zips and hems. You'll see there's never just one way to do things in dressmaking (and you don't always have to stick to the rules!). We want to encourage you to find your own personal way. We'll be working on making a skirt during the course so you can see the magic of the techniques come together to make a finished and wearable item, as well as a sample book of extra techniques. You don't have to make the skirt for yourself, but please bring measurements of person you are making it for. There will be options for different skirt styles. We know dressmaking can seem like a daunting prospect at first but it's easy when you know how! It gives you the opportunity to be unique and creative with your style. It's a great way to relax and unwind, make new creative friends and you can become part of the growing Make Mee Community. A really great course with excellent teacher. Very laid back, friendly atmosphere, everything explained step by step as you go along, taking time to make sure everyone follows. Went away feeling like I had really learnt how to use a sewing machine and was very proud of my skirt. 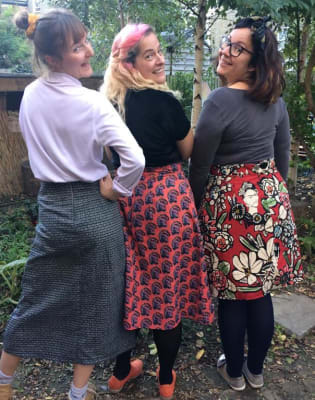 I really enjoyed Tracie and Jamie's beginners dressmaking course, they were both full of knowledge and were happy to adjust the patter of the skirt to include extra things like pockets and pleats! I had a fantastic time learning to alter some of my unloved clothes. I was able to take in a pair of trousers, alter the sleeves of a blouse and make a long cardigan into a cropped cardigan with elastic in the bottom to add shape. I feel that I learnt so many skills in such a short amount of time! The teachers were so friendly and helpful that I had a brilliant time. I feel so happy that I now have three new items to wear regularly that were just sitting at the back of my wardrobe. Thank you! Tracey and Jamie are the best teachers - super patient, friendly and brilliant at making all the tasks easy to understand and super fun. I cannot speak highly enough of these lovely ladies. The studio is so welcoming and I love going back to learn more. 3 workshops ( 2 different skirt workshops and zip pouches) so far and more to come! If you want to learn about sewing whether you’re a beginner or an improver, this is the place to go! You won’t regret it. My daughter Lotte loves going to her sewing class on Wednesdays and has received loads of compliments for the trousers she made there. Jamie, the teacher, is great with the kids and has taught her a lot in a short time. We're so glad we found Make Mee. 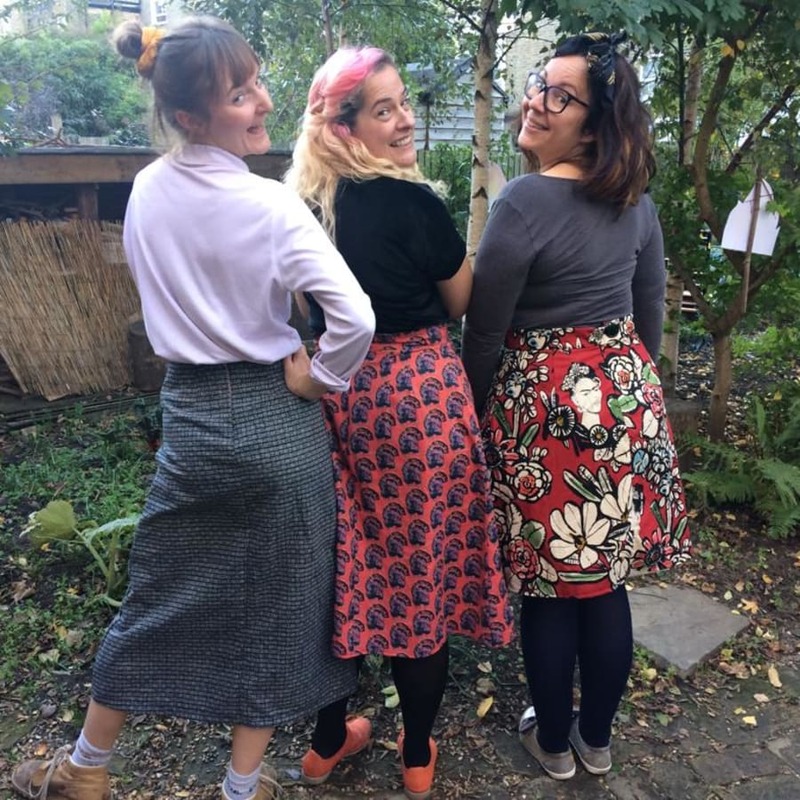 Learning some dressmaking & sewing basics in Tracey's garden studio was one of the best things I did in 2018 - the atmosphere was lovely, teaching was great, I walked away with a lovely skirt and both a thirst & the confidence to dive into more (beginner level) projects. Would really recommend this! Make Mee Studio is run by Tracey & Jaime. 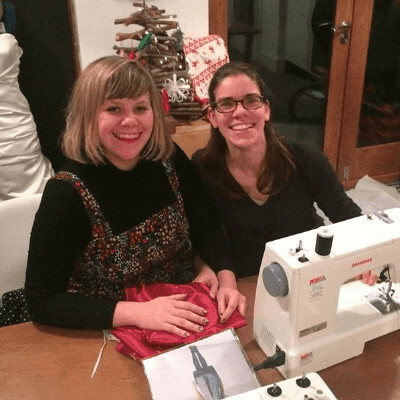 Two enthusiastic lifelong sewers (both sewing since they were 5 years old!) They love sharing their making skills with others, and have over 10 years of combined teaching experience working with adults and children. 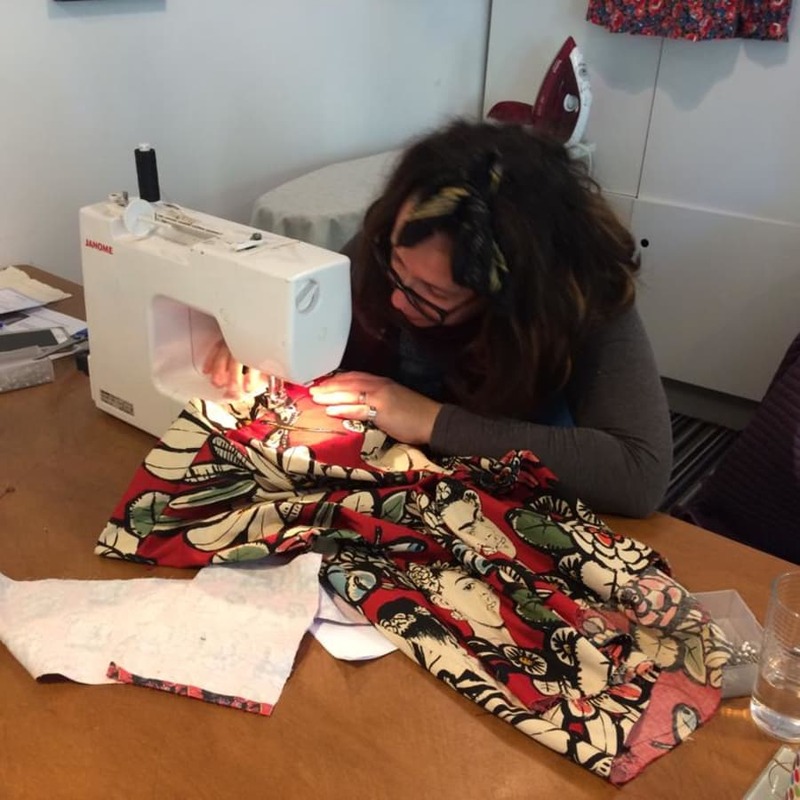 They offer sewing lessons, parties, alterations, makes and commissions in their Brockley, South East London based garden studio and are also available for external school and community projects. Tracey is a very experienced seamstress who has been working in the business for over 18 years, she started as a costume assistant working for Grenada and the BBC going on to run her own bespoke label and then she began teaching 6 years ago and fell in love. She one of the most precise sewers you'll ever meet and always has a handy hint or trick up her sleeve. She loves keeping the studio neat, tidy and organised, everything has a place! Jaime primarily studied Textile Design gaining a Masters from Chelsea College of Art. Her passion lies in sustainable fashion and textiles, she began teaching as an antidote to the endless cycle of fast fashion. Teaching people how to make and sew and fix and mend themselves can have a huge impact on how they consume and how they feel about their clothing. She is a self-taught dressmaker and loves encouraging people to make things unique, she's a magpie for anything, velvet, fluffy or sparkly and is terrible at keeping to Tracey's organised system! If you have any questions, please contact Tracey & Jaime using the ‘contact host’ button on the website page. We have a well equiped studio with everything you need for dressmaking.We do have a small selection of fabrics and trims in the studio which you can purchase for a donation towards our tea and cake fund. If you would like to bring your own fabric you will need at least 1.5m. A mediumweight woven is ideal, this skirt will not work in stretch fabric. Feel free to get in touch before the class to discuss fabric choices. The fabric MUST be washed before you use it. (A normal 30-degree wash is perfect.) You will also need a zip for your skirt, we have some here but you may want to source one externally that matches your fabric. It would be good to discuss this on the first lesson so you can choose what kind of zip you want to put in! We won't need the zip until lesson 3. If you would like to practice sewing on your own machine please feel free to bring it along.